I have been really wanting a table runner in the dining room for a while now, but I had no idea what I wanted it to look like. Well, I googled “table runner ideas” and discovered a lot of really cool ones! 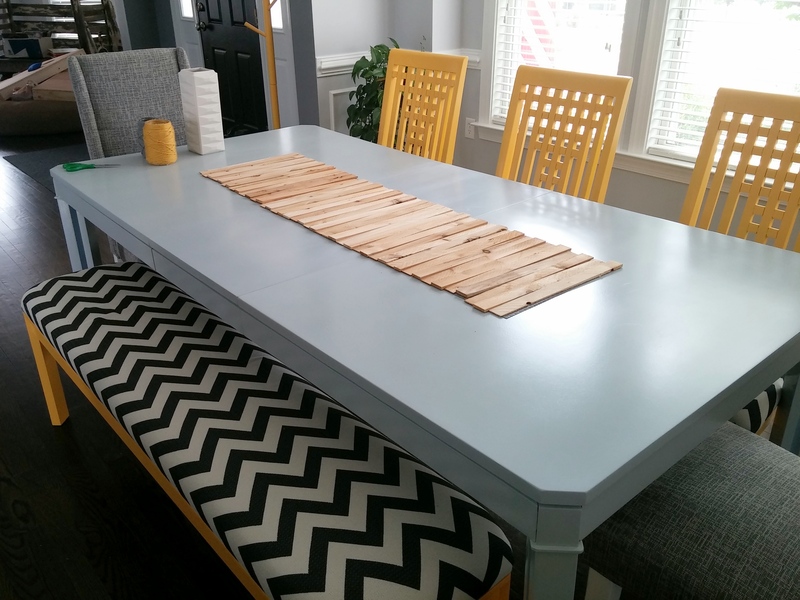 I was torn between a table runner that was painted to look like a really long ruler across the table (the teacher in me just LOVED that), and a table runner made out of wood shims. After asking several people for their opinion, I decided to go with the wooden shims table runner. 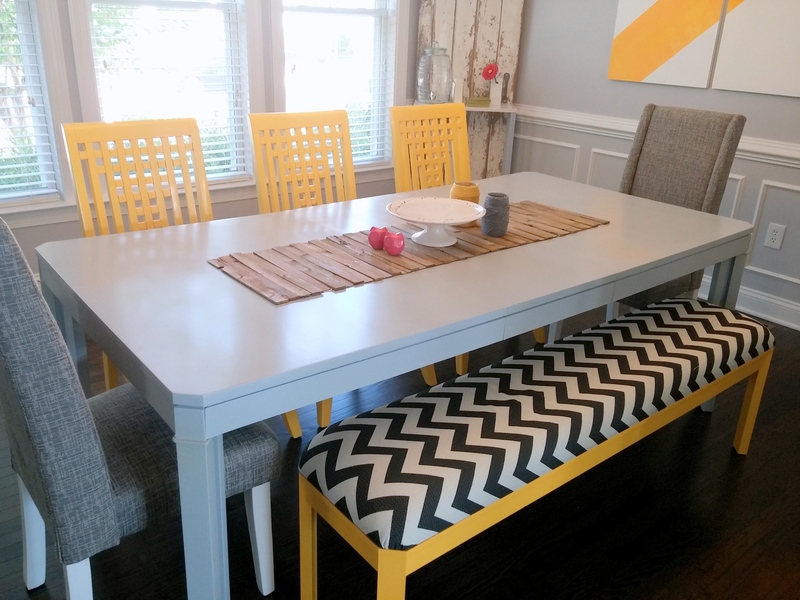 The best part about this project was that it cost me less than $10 to complete! Also, I think it’s completely adorable (that may be because I made it…). I went to Home Depot & bought this pack of shims for $3.98. I bought 2 packs because I wasn’t sure how many I was going to need. I also talked to an associate there and they said that the cedar would stain really well. Turns out I only needed 1 pack of the shims, but my husband has claimed the other pack for himself! I laid the shims out on the table and took measurements on how long they were and how wide. Once I had the measurements I took them all into the basement and first sanded them down as best I could, and then I stained them (tops and all 4 edges). I stained them with the same stain we used on our coffee table since I wanted to try for a weathered look, and I didn’t want them to be too dark and match too much with our wood floors. I LOVE this stain because it already has poly in it, so I didn’t have to worry about trying to poly all of them afterwards. Once they were all stained I went upstairs and looked around my fabric pile. I cut a piece of fabric that was about 1.5 inches shorter in length than the shims, and also about 1 inch shorter in width. I used Power Grab glue to glue each piece onto the fabric. After letting it dry for a few hours we carried it upstairs & put it on our dining table! I think it looks fabulous. ATTENTION ALL WHO ACTUALLY READ THIS BLOG: Let me start of by sharing with you the biggest lesson learned from this reno: Different plumbing fixture brands each have their own type of shower valve in the wall behind the shower, and each brand will only work with their own shower valve. So, if you currently have a Moen shower wall faucet and plan to install say, a Kohler wall faucet, you will have to replace the valve in the wall. We learned this the HARD way and it cost us a lot of time!! Okay, that being said, this project was actually a lot of fun and I learned a lot through the process! We had originally not planned on renovating this space until later this fall, but during the summer I took two graduate courses, and one of my professors let us choose literally anything to do for our project as long as we fulfilled the learning requirements. Hellooooo new bathroom. The space feels so completely different and it’s just so nice to go into this bathroom and actually enjoy how it looks! As you can see it was full of white boring-ness (and it was also pretty gross. The white grout lines were not very white anymore). It was definitely time for some upgrades! 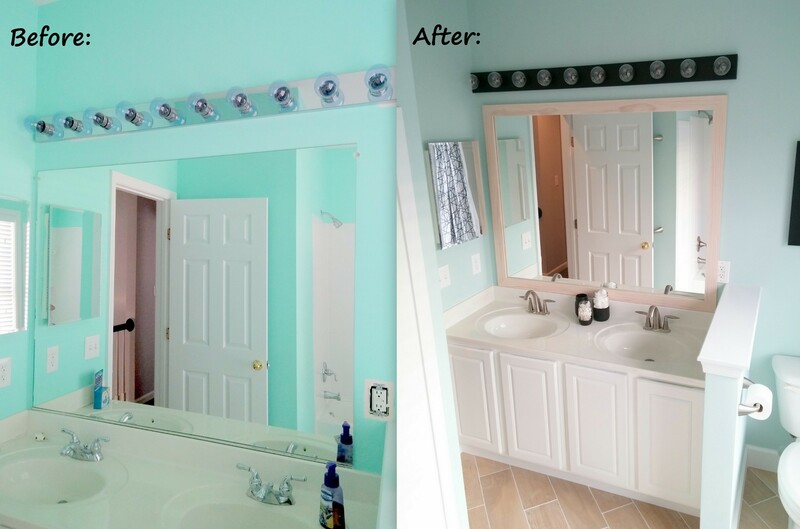 In a nutshell we replaced the old tile with a beautiful new ceramic tile floor, added a frame around the mirror, spray painted the light fixture, replaced all the faucets, and added that beautiful piece of moulding by the shower to hang a towel or robe. (And of course we painted the entire space: ceiling, walls, and trim). 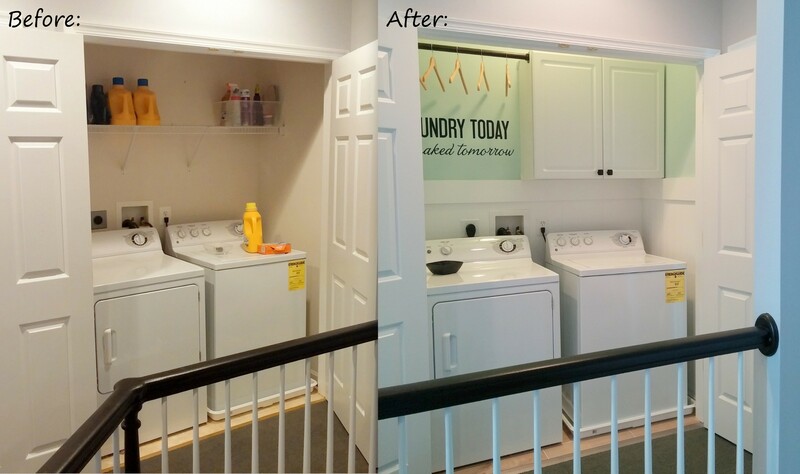 My husband and I unexpectedly decided to renovate our laundry room while we were also renovating our guest bathroom that is located on the other side of the laundry room wall. While we were renovating the bathroom we cut a big hole in the wall so that we could see the pipes behind the shower, and well, since our laundry space had a big hole in the wall and the machines were removed we thought we would just go for it! We are so happy with how the space turned out. I am especially happy because now doing laundry will be such a happier chore! Our house is ten years old, and while we cleaned it thoroughly when we bought it last summer, I did not think to move the dryer out of the room and clean under it. That was a big mistake: YUCK!